Zion expected to sign sneaker deal before NBA Draft Lottery. 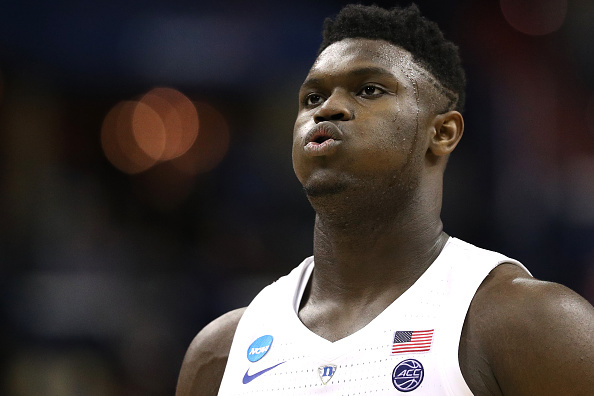 Zion Williamson's Duke Blue Devils were eliminated from the NCAA Tournament on Sunday, courtesy of the Michigan State Spartans, and he will soon officially declare for the NBA Draft. As NBA teams like the New York Knicks, Phoenix Suns, Cleveland Cavaliers and others jockey for position in the Zion Williamson sweepstakes, sneaker brands across the board are doing the same, and it is believed we could have a historic shoe deal on our hands. According to ESPN's Nick DePaula, "Vaccaro signed Michael Jordan at Nike in 1984 and later looked to offer James a $100 million contract at Adidas. Sources at multiple brands across the industry expect Williamson's deal to reach that astronomical tier." Worth noting, LeBron James ultimately inked a seven-year, $87 million deal out of high school, while Kevin Durant's rookie deal was for 7-years, $60 million. "In my lifetime, I think it's going to be the biggest bidding war ever done," former sneaker executive Sonny Vaccaro said, per ESPN. "I would put them all on go." In addition to Nike and Adidas, Under Armour, New Balance, PUMA and Anta are all expected to make pitches to the 18-year old phenom. And we could find out who wins out sooner rather than later, as DePaula notes, "the expectation is that Williamson will sign his deal before the May 14 draft lottery, when the draft order will be set."